If there is any reason at all to feel like a proud South African then today is surely the day and Twiggy is the reason. To most South Africans, the name Grant ‘Twiggy’ Baker is like any other but within the loins of the surf community, that name means business, serious business, and with good reason, the man is as tough as nails and has the heart of a lion beating in his chest. On Friday, Twiggy cleaned the pipes of 23 of the world’s top big wave surfers at the Body Glove Mavericks Invitational held in perfect 40ft surf at Pillar Point, Half Moon Bay, California. 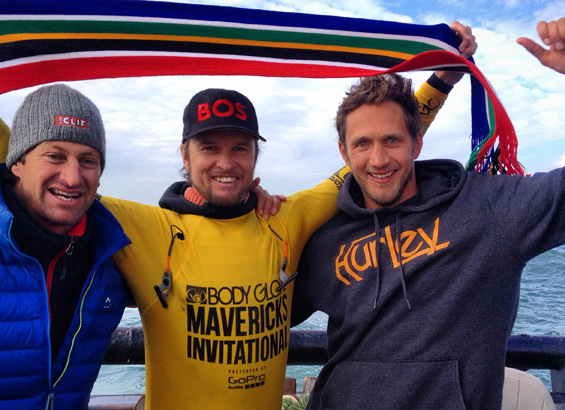 That’s a huge achievement for South Africa and South African surfing right there. Twiggy scored two amazing 10-point rides during the event to score an overall 29.33 out of 30, which is a phenomenal performance considering that Shane Dorian, who placed second, came in with a score of 25.53 out of 30. Twiggy clearly dominated the lineup and put his best foot forward to claim his second Mavericks crown and his second consecutive win on the Big Wave World Tour after conquering the Arnette Punta Galea Challenge in Spain this past December. 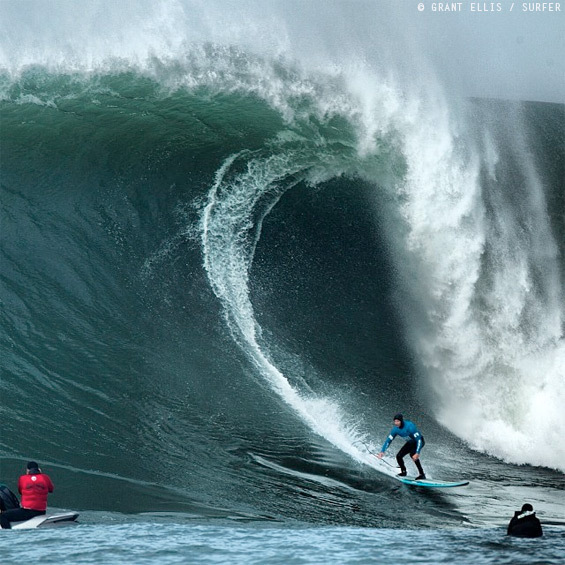 The result puts Grant ‘Twiggy’ Baker right on top of the Big Wave World Tour (BWWT) standings. Twiggy had the following to say shortly after the event, “I’m feeling pretty good – amazing in fact! Two of my favourite surfers in the world, Shane Dorian and Greg Long, were in the final so to win Mavericks is the greatest feeling in the world!”. Twiggy wasn’t the only South African representing on the day. Fellow big wave chargers Chris Bertish (2010 Mavericks Champ) and Frank Solomon (Alternate Competitor) were also there to celebrate the big win. This entry was posted in News Desk and tagged Big wave surfers, big wave surfing, Big Wave World Tour, Chris Bertish, Frank Solomon, Grant Twiggy Baker, Mavericks, Mavericks Invitational 2014, Shane Dorian, surf, surfing, Twiggy. Bookmark the permalink.